A movie theater may also be referred to as a movie theatre, movie house, film house, film theater or picture house. In the US, theater has long been the preferred spelling, while in the UK, Australia, Canada and elsewhere it is theatre. However, some US theaters opt to use the British spelling in their own names, a practice supported by the National Association of Theatre Owners, while apart from North America most English-speaking countries use the term cinema /ˈsɪnɪmə/, alternatively spelled and pronounced kinema /ˈkɪnɪmə/. The latter terms, as well as their derivative adjectives "cinematic" and "kinematic", ultimately derive from Greek κινῆμα, κινήματος (kinema, kinematos)—"movement", "motion". In the countries where those terms are used, the word "theatre" is usually reserved for live performance venues. 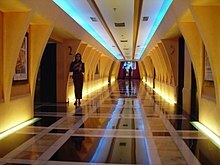 The etymology of the term "movie theater" involves the term "movie", which is a "shortened form of moving picture in the cinematographic sense" that was first used in 1896 and "theater", which originated in the "...late 14c., [meaning an] "open air place in ancient times for viewing spectacles and plays". The term "theater" comes from the Old French word "theatre", from the 12th century and "...directly from Latin theatrum [which meant] 'play-house, theater; stage; spectators in a theater'", which in turn came from the Greek word "theatron", which meant "theater; the people in the theater; a show, a spectacle", [or] literally "place for viewing". The use of the word "theatre" to mean a "building where plays are shown" dates from the 1570s in the English language. L'Idéal Cinéma at Aniche, opened on 23 November 1905, during the silent film era, and one of the oldest still-active cinemas in the world. The next significant step towards movies was the development of an understanding of image movement. Simulations of movement date as far back as to 1828, when Paul Roget discovered the phenomenon he called "persistence of vision". Roget showed that when a series of still images are shown rapidly in front of a viewer's eye, the images merge into one registered image that appears to show movement, an optical illusion, since the image is not actually moving. This experience was further demonstrated through Roget's introduction of the thaumatrope, a device which spun a disk with an image on its surface at a fairly high rate of speed. The French Lumière brothers' (Louis and Auguste Lumière) first film, Sortie de l'usine Lumière de Lyon, shot in 1894, is considered the first true motion picture. This was followed by their 1895 film L'Arrivée d'un train en gare de La Ciotat. The first commercial film screening took place in Paris on 28 December 1895, a set of 10 short films, followed by a screeing of L'Arrivée d'un train en gare de La Ciotat in January 1896 in a number of locations including La Ciotat itself. Claimants for the title of the earliest movie theatre include the Eden Theatre in La Ciotat, where L'Arrivée d'un train en gare de La Ciotat was screened on 21 March 1899. The theatre closed in 1995 but re-opened in 2013. Prior to the re-opening, another claimant was the L'Idéal Cinéma Jacques Tati which showed its first film on 23 November 1905, and closed in 1977. It re-opened in 1995. The Korsør Biograf Teater, Denmark, opened in August 1908 and is the oldest movie theater still in continuous operation. Canada was the first country in the world to have a two-screen theater. 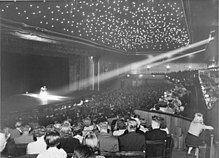 The Elgin Theatre in Ottawa, Ontario became the first venue to offer two film programs on different screens in 1957 when Canadian theater-owner Nat Taylor converted the dual screen theater into one capable of showing two different movies simultaneously. Taylor is credited by Canadian sources as the inventor of the multiplex or cineplex; he later founded the Cineplex Odeon Corporation, opening the 18-screen Toronto Eaton Centre Cineplex, the world's largest at the time, in Toronto, Ontario. In the United States, Stanley Durwood of American Multi-Cinema (now AMC Theatres) is credited as pioneering the multiplex in 1963 after realizing that he could operate several attached auditoriums with the same staff needed for one through careful management of the start times for each movie. Ward Parkway Center in Kansas City, Missouri had the first multiplex cinema in the United States. Since the 1960s, multiple-screen theaters have become the norm, and many existing venues have been retrofitted so that they have multiple auditoriums. A single foyer area is shared among them. In the 1970s many large 1920s movie palaces were converted into multiple screen venues by dividing their large auditoriums, and sometimes even the stage space, into smaller theaters. Because of their size, and amenities like plush seating and extensive food/beverage service, multiplexes and megaplexes draw from a larger geographic area than smaller theaters. As a rule of thumb, they pull audiences from an eight to 12-mile radius, versus a three to five-mile radius for smaller theaters (though the size of this radius depends on population density). As a result, the customer geography area of multiplexes and megaplexes typically overlaps with smaller theaters, which face threat of having their audience siphoned by bigger theaters that cut a wider swath in the movie-going landscape. In most markets, nearly all single-screen theaters (sometimes referred to as a "Uniplex") have gone out of business; the ones remaining are generally used for arthouse films, e.g. the Crest Theatre in downtown Sacramento, California, small-scale productions, film festivals or other presentations. Because of the late development of multiplexes, the term "cinema" or "theater" may refer either to the whole complex or a single auditorium, and sometimes "screen" is used to refer to an auditorium. A popular film may be shown on multiple screens at the same multiplex, which reduces the choice of other films but offers more choice of viewing times or a greater number of seats to accommodate patrons. Two or three screens may be created by dividing up an existing cinema (as Durwood did with his Roxy in 1964), but newly built multiplexes usually have at least six to eight screens, and often as many as twelve, fourteen, sixteen or even eighteen. Although definitions vary, a large multiplex with 20 or more screens is usually called a "megaplex". However, in the United Kingdom, this was a brand name for Virgin Cinema (later UGC). The first megaplex is generally considered to be the Kinepolis in Brussels, Belgium, which opened in 1988 with 25 screens and a seating capacity of 7,500. The first theater in the U.S. built from the ground up as a megaplex was the AMC Grand 24 in Dallas, Texas, which opened in May 1995, while the first megaplex in the U.S.-based on an expansion of an existing facility was Studio 28 in Grand Rapids, Michigan, which reopened in November 1988 with 20 screens and a seating capacity of 6,000. The smallest purpose-built cinema is the Cabiria Cine-Cafe which measures 24 m² (258.3 ft²) and has a seating capacity of 18. It was built by Renata Carneiro Agostinho da Silva (Brazil) in Brasília DF, Brazil in 2008. It is mentioned in the 2010 Guinness World Records. The World's smallest solar-powered mobile cinema is Sol Cinema in the UK. Touring since 2010 the cinema is actually a converted 1972 caravan. It seats 8–10 at a time. In 2015 it featured in a Lenovo advert for the launch of a new tablet. The Bell Museum of Natural History in Minneapolis, Minnesota has recently begun summer "bike-ins", inviting only pedestrians or people on bicycles onto the grounds for both live music and movies. In various Canadian cities, including Toronto, Calgary, Ottawa and Halifax, al-fresco movies projected on the walls of buildings or temporarily erected screens in parks operate during the Summer and cater to a pedestrian audience. The New Parkway Museum in Oakland, California replaces general seating with couches and coffee tables, as well as having a full restaurant menu instead of general movie theater concessions such as popcorn or candy. The earliest 3D movies were presented in the 1920s. There have been several prior "waves" of 3D movie distribution, most notably in the 1950s when they were promoted as a way to offer audiences something that they could not see at home on television. Still the process faded quickly and as yet has never been more than a periodic novelty in movie presentation. The "golden era" of 3D film began in the early 1950s with the release of the first color stereoscopic feature, Bwana Devil. The film starred Robert Stack, Barbara Britton and Nigel Bruce. James Mage was an early pioneer in the 3D craze. Using his 16 mm 3D Bolex system, he premiered his Triorama program in February 1953 with his four shorts: Sunday In Stereo, Indian Summer, American Life, and This is Bolex Stereo. 1953 saw two groundbreaking features in 3D: Columbia's Man in the Dark and Warner Bros. House of Wax, the first 3D feature with stereophonic sound. For many years, most 3-D movies were shown in amusement parks and even "4-D" techniques have been used when certain effects such as spraying of water, movement of seats, and other effects are used to simulate actions seen on the screen. The first decline in the theatrical 3D craze started in August and September 1953. In 2009, movie exhibitors became more interested in 3D film. The number of 3D screens in theaters is increasing. The RealD company expects 15,000 screens worldwide in 2010. The availability of 3D movies encourages exhibitors to adopt digital cinema and provides a way for theaters to compete with home theaters. One incentive for theaters to show 3D films is that although ticket sales have declined, revenues from 3D tickets have grown. In the 2010s, 3D films became popular again. The IMAX 3D system and digital 3D systems are used (the latter is used in the animated movies of Disney/Pixar). When a system is used that requires inexpensive 3D glasses, they can sometimes be kept by the patron. Most theaters have a fixed cost for 3D, while others charge for the glasses, but the latter is uncommon (at least in the United States). For example, in Pathé theaters in the Netherlands the extra fee for watching a 3D film consists of a fixed fee of €1.50, and an optional fee of €1 for the glasses. Holders of the Pathé Unlimited Gold pass (see also below) are supposed to bring along their own glasses; one pair, supplied yearly, more robust than the regular type, is included in the price. IMAX is a system using film with more than ten times the frame size of a 35 mm film to produce image quality far superior to conventional film. IMAX theaters use an oversized screen as well as special projectors. Invented by a Canadian company, the first permanent IMAX theater was at Ontario Place in Toronto, Canada. At the IMAX cinema attached to the National Media Museum in Bradford, West Yorkshire, England, United Kingdom, visitors to the museum's sixth floor can observe the IMAX projection booth via a glass rear wall and watch the large format films being loaded and projected. There is also an IMAX theater in the Museum of science in Boston Massachusetts. Usually in the 2010s, an admission is for one feature film. Sometimes two feature films are sold as one admission (double feature), with a break in between. Separate admission for a short subject is rare; it is either an extra before a feature film or part of a series of short films sold as one admission (this mainly occurs at film festivals). (See also anthology film.) In the early decades of "talkie" films, many movie theaters presented a number of shorter items in addition to the feature film. This might include a newsreel, live-action comedy short films, documentary short films, musical short films, or cartoon shorts (many classic cartoons series such as the Looney Tunes and Mickey Mouse shorts were created for this purpose). Examples of this kind of programming are available on certain DVD releases of two of the most famous films starring Errol Flynn as a special feature arrangement designed to recreate that kind of filmgoing experience while the PBS series, Matinee at the Bijou, presented the equivalent content. Some theaters ran on continuous showings, where the same items would repeat throughout the day, with patrons arriving and departing at any time rather than having distinct entrance and exit cycles. Newsreels gradually became obsolete by the 1960s with the rise of television news, and most material now shown prior to a feature film is of a commercial or promotional nature (which usually include "trailers", which are advertisements for films and commercials for other consumer products or services). Until the multiplex era, prior to showtime, the screen in some theaters would be covered by a curtain, in the style of a theater for a play. The curtain would be drawn for the feature. It is common practice in Australia for the curtain to cover part of the screen during advertising and trailers, then be fully drawn to reveal the full width of the screen for the main feature. Some theaters, lacking a curtain, filled the screen with slides of some form of abstract art prior to the start of the movie. Currently, in multiplexes, theater chains often feature a continuous slideshow between showings featuring a loop of movie trivia, promotional material for the theater chains (such as encouraging patrons to purchase drinks, snacks and popcorn, gift vouchers and group rates, or other foyer retail offers), or advertising for local and national businesses. Advertisements for Fandango and other convenient methods of purchasing tickets is often shown. Also prior to showing the film, reminders, in varying forms would be shown concerning theater etiquette (no smoking, no talking, no littering, removing crying babies, etc.) and in recent years, added reminders to silence mobile phones as well warning as concerning movie piracy with camcorders ("camming"). Some well-equipped theaters have "interlock" projectors which allow two or more projectors and sound units to be run in unison by connecting them electronically or mechanically. This set up can be used to project two prints in sync (for dual-projector 3-D) or to "interlock" one or more sound tracks to a single film. Sound interlocks were used for stereophonic sound systems before the advent of magnetic film prints. Fantasound (developed by RCA in 1940 for Disney's Fantasia) was an early interlock system. Likewise, early stereophonic films such as This Is Cinerama and House of Wax utilized a separate, magnetic oxide-coated film to reproduce up to six or more tracks of stereophonic sound. Datasat Digital Entertainment, purchaser of DTS's cinema division in May 2008, uses a time code printed on and read off of the film to synchronize with a CD-ROM in the sound track, allowing multi-channel soundtracks or foreign language tracks. This is not considered a projector interlock, however. This practice is most common with blockbuster movies. Muvico Theaters, Regal Entertainment Group, Pacific Theatres and AMC Theatres are some theaters that interlock films. In order to obtain admission to a movie theater, the prospective theater-goer must usually purchase a ticket from the box office, which may be for an arbitrary seat ("open" or "free" seating, first-come, first-served) or for a specific one (allocated seating). As of 2015, some theaters sell tickets online or at automated kiosks in the theater lobby. Movie theaters in North America generally have open seating. Cinemas in Europe can have free seating or numbered seating. Some theaters in Mexico offer numbered seating, in particular, Cinepolis VIP. In the case of numbered seating systems the attendee can often pick seats from a video screen. Sometimes the attendee cannot see the screen and has to make a choice based on a verbal description of the still available seats. In the case of free seats, already seated customers may be asked by staff to move one or more places for the benefit of an arriving couple or group wanting to sit together. For 2013, the average price for a movie ticket in the United States was $8.13. The price of a ticket may be discounted during off-peak times e.g. for matinees, and higher at busy times, typically evenings and weekends. In Australia, Canada and New Zealand, when this practice is used, it is traditional to offer the lower prices for Tuesday for all showings, one of the slowest days of the week in the movie theater business, which has led to the nickname "cheap Tuesday". Sometimes tickets are cheaper on Monday, or on Sunday morning. Almost all movie theaters employ economic price discrimination: tickets for youth, students, and seniors are typically cheaper. Large theater chains, such as AMC Theaters, also own smaller theaters that show "second runs" of popular films, at reduced ticket prices. Movie theaters in India and other developing countries employ price discrimination in seating arrangement: seats closer to the screen cost less, while the ones farthest from the screen cost more. In the United States, many movie theater chains sell discounted passes, which can be exchanged for tickets to regular showings. These passes are traditionally sold in bulk to institutional customers and also to the general public at Bulktix.com. Some passes provide substantial discounts from the price of regular admission, especially if they carry restrictions. Common restrictions include a waiting period after a movie's release before the pass can be exchanged for a ticket or specific theaters where a pass is ineligible for admission. Some movie theaters and chains sell monthly passes for unlimited entrance to regular showings. Cinemas in Thailand have a restriction of one viewing per movie. The increasing number of 3D movies, for which an additional fee is required, somewhat undermines the concept of unlimited entrance to regular showings, in particular if no 2D version is screened, except in the cases where 3D is included. Also, in one Pathé theater in the Netherlands on one day of the week buying a drink and a snack is compulsory. Some adult theaters sell a day pass, either as standard ticket, or as an option that costs a little more than a single admission. Also for some film festivals, a pass is sold for unlimited entrance. Discount theaters show films at a greatly discounted rate, however, the films shown are generally films that have already run for many weeks at regular theaters and thus are no longer a major draw, or films which flopped at the box office and thus have already been removed from showings at major theaters in order to free up screens for films that are a better box office draw. Some cinemas in city centers offer luxury seating with services like complimentary refills of soft drinks and popcorn, a bar serving beer, wine and liquor, reclining leather seats and service bells. Cinemas must have a liquor license to serve alcohol. The Vue Cinema and CGV Cinema chain is a good example of a large-scale offering of such a service, called "Gold Class" and similarly, ODEON, Britain's largest cinema chain, have gallery areas in some of their bigger cinemas where there is a separate foyer area with a bar and unlimited snacks. Movie studios/film distributors in the US traditionally drive hard bargains entitling them to as much as 100% of the gross ticket revenue during the first weeks (and then the balance changes in 10% increments in favor of exhibitors at intervals that vary from film to film). Film exhibition has seen a rise in its development with video consolidation as well as DVD sales, which over the past two decades is the biggest earner in revenue. According to The Contemporary Hollywood Film Industry, Philip Drake states that box office takings currently account for less than a quarter of total revenues and have become increasingly "front loaded", earning the majority of receipts in the opening two weeks of exhibition, meaning that films need to make an almost instant impact in order to avoid being dropped from screens by exhibitors. Essentially, if the film does not succeed in the first few weeks of its inception, it will most likely fail in its attempt to gain a sustainable amount of revenue and thus being taken out from movie theaters. Furthermore, higher-budget films on the "opening weekend", or the three days, Friday to Sunday, can signify how much revenue it will bring in, not only to America, but as well as overseas. It may also determine the price in distribution windows through home video and television. In Canada, the total operating revenue in the movie theater industry was $1.7 billion in 2012, an 8.4% increase from 2010. This increase was mainly the result of growth in box office and concession revenue. Combined, these accounted for 91.9% of total industry operating revenue. In the US, the "...number of tickets sold fell nearly 11% between 2004 and 2013, according to the report, while box office revenue increased 17%" due to increased ticket prices. 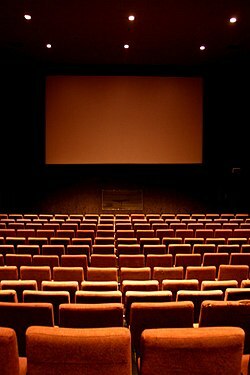 One reason for the decline in ticket sales in the 2000s is that "home-entertainment options [are] improving all the time— whether streamed movies and television, video games, or mobile apps—and studios releasing fewer movies", which means that "people are less likely to head to their local multiplex". A Pew Media survey from 2006 found that the relationship between movies watched at home versus at the movie theater was in a five to one ratio and 75% of respondents said their preferred way of watching a movie was at home, versus 21% who said they preferred to go to a theater. In 2014, it was reported that the practice of releasing a film in theaters and via on-demand steaming on the same day (for selected films) and the rise in popularity of the Netflix streaming service has led to concerns in the movie theater industry. Another source of competition is television, which has "...stolen a lot of cinema's best tricks – like good production values and top tier actors – and brought them into people's living rooms". Since the 2010s, one of the increasing sources of competition for movie theaters is the increasing ownership by people of home theater systems which can display high-resolution Blu-ray disks of movies on large, widescreen flat-screen TVs, with 5.1 surround sound and a powerful subwoofer for low-pitched sounds. The relatively strong uniformity of movie ticket prices, particularly in the U.S., is a common economics puzzle, because conventional supply and demand theory would suggest higher prices for more popular and more expensive movies, and lower prices for an unpopular "bomb" or for a documentary with less audience appeal. Unlike seemingly similar forms of entertainment such as rock concerts, in which a popular performer's tickets cost much more than an unpopular performer's tickets, the demand for movies is very difficult to predict ahead of time. Indeed, some films with major stars, such as Gigli (which starred the then-supercouple of Ben Affleck and Jennifer Lopez), have turned out to be box-office bombs, while low-budget films with unknown actors have become smash hits (e.g., The Blair Witch Project). The demand for films is usually determined from ticket sale statistics after the movie is already out. Uniform pricing is therefore a strategy to cope with unpredictable demand. Historical and cultural factors are sometimes also cited. Advertising: Some moviegoers complain about commercial advertising shorts played before films, arguing that their absence used to be one of the main advantages of going to a movie theater. Other critics such as Roger Ebert have expressed concerns that these advertisements, plus an excessive number of movie trailers, could lead to pressure to restrict the preferred length of the feature films themselves to facilitate playing schedules. So far, the theater companies have typically been highly resistant to these complaints, citing the need for the supplementary income. Some chains like Famous Players and AMC Theatres have compromised with the commercials restricted to being shown before the scheduled start time for the trailers and the feature film. Individual theaters within a chain also sometimes adopt this policy. Loudness: Another major recent concern is that the dramatic improvements in stereo sound systems and in subwoofer systems have led to cinemas playing the soundtracks of films at unacceptably high volume levels. Usually, the trailers are presented at a very high sound level, presumably to overcome the sounds of a busy crowd. The sound is not adjusted downward for a sparsely occupied theater. Volume is normally adjusted based on the projectionist's judgment of a high or low attendance. The film is usually shown at a lower volume level than the trailers. In response to audience complaints, a manager at a Cinemark theater in California explained that the studios set trailer sound levels, not the theater. Some theaters (including those with IMAX stadiums) have detectors at the doors to pick up recording smugglers. At particularly anticipated showings, theaters may employ night vision equipment to detect a working camera during a screening. In some jurisdictions this is illegal unless the practice has been announced to the public in advance. Crowd control: As movie theaters have grown into multiplexes and megaplexes, crowd control has become a major concern. An overcrowded megaplex can be rather unpleasant, and in an emergency can be extremely dangerous (indeed, "shouting fire in a crowded theater" is the standard example of the limits to free speech, because it could cause a deadly panic). Therefore, all major theater chains have implemented crowd control measures. The most well-known measure is the ubiquitous holdout line which prevents ticket holders for the next showing of that weekend's most popular movie from entering the building until their particular auditorium has been cleared out and cleaned. 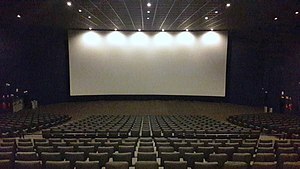 Since the 1980s, some theater chains (especially AMC Theatres) have developed a policy of co-locating their theaters in shopping centers (as opposed to the old practice of building stand-alone theaters). In some cases, lobbies and corridors cannot hold as many people as the auditoriums, thus making holdout lines necessary. In turn, ticket holders may be enticed to shop or eat while stuck outside in the holdout line. However, given the fact that rent is based on floor area, the practice of having a smaller lobby is somewhat understandable. Refunds: Most cinema companies issue refunds if there is a technical fault such as a power outage that stops people from seeing a movie. Refunds may be offered during the initial 30 minutes of the screening. The New York Times reported that some audience members walked out of Terrence Malick's film Tree of Life and asked for refunds. At AMC theaters, "...patrons who sat through the entire film and then decided they wanted their money back were out of luck, as AMC's policy is to only offer refunds 30 minutes into a screening. The same goes for Landmark, an independent movie chain... whose policy states, "If a film is not what is expected… and the feature is viewed less than 30 minutes a refund can be processed for you at the box office." Snack prices: The price of soft drinks and candy at theaters is typically significantly higher than the cost of those items at a fast food chain and food store, respectively. Popcorn prices can also be exorbitant. It has been "...estimated that movie theaters make an 85% profit at the concessions stand on overpriced soda, candy, nachos, hot dogs and, of course, popcorn. Movie-theater popcorn has been called one of America's biggest rip-offs, with a retail price of nine times what it costs to make." In North America, the National Association of Theatre Owners (NATO) is the largest exhibition trade organization in the world. According to their figures, the top four chains represent almost half of the theater screens in North America. In Canada, Cineplex Entertainment is the largest and movie theater company with 161 locations and 1,635 screens. The studios once controlled many theaters, but after the appearance of Mr. Smith Goes to Washington, Congress passed the Neely Anti-Block Booking Act, which eventually broke the link between the studios and the theaters. Now, the top three chains in the U.S. are Regal Entertainment Group, AMC Entertainment Inc and Cinemark Theatres. In 1995, Carmike was the largest chain in the United States- now, the major chains include AMC Entertainment Inc – 5,206 screens in 346 theaters, Cinemark Theatres – 4,457 screens in 334 theaters, Landmark Theatres – 220 screens in 54 theaters, Marcus Theatres – 681 screens in 53 theaters. National Amusements – 409 screens in 32 theaters and Regal Entertainment Group – 7,334 screens in 588 cinemas. In 2015 the United States had a total of 40,547 screens. In Mexico, the major chains are Cinepolis and Cinemex. In Asia, Wanda Cinemas is the largest exhibitor in China, with 2,700 screens in 311 theaters and with 18% of the screens in the country; another major Chinese chain is UA Cinemas. China had a total of 31,627 screens in 2015 and is expected to have almost 40,000 in 2016. Hong Kong has AMC Theatres. In India, PVR Cinemas is a leading cinema operating a chain of 500 screens and CineMAX and INOX are both multiplex chains. Indonesia has the 21 Cineplex chain. A major Israel theater is Cinema City International. Japanese chains include Toho and Shochiku. ^ Originally spelled theatre and teatre (c. 1380), from around 1550 to 1700 or later, the most common spelling was theater. Between 1720 and 1750, theater was dropped in British English but was either retained or revived in American English (Oxford English Dictionary, 2nd edition, 2009, CD-ROM: ISBN 9780199563838). Recent dictionaries of American English list theatre as a less common variant, e.g., Random House Webster's College Dictionary (1991); The American Heritage Dictionary of the English Language, 4th edition (2006); New Oxford American Dictionary, third edition (2010); Merriam-Webster Dictionary (2011). ^ "World's oldest cinema to reopen in France's La Ciotat". France 24. 9 October 2013. Retrieved 22 April 2019. ^ McDonald, Paul; Wasko, Janet (2008). The Contemporary Hollywood Film Industry. Malden, MA: Blackwell. p.��126.